Taken from Sketches of Tennessee’s Pioneer Baptist Preachers by J.J Burnett, Nashville, Tenn.: Press of Marshall & Bruce Company, 1919. Twenty years ago (August 5, 1896) the author published in The East Tennessee Baptist a sketch of William Arthur Armstrong Keen, dedicating it to the Holston Association. A lapse of twenty years, and six years of added life to our subject, make necessary some changes and additions. So I recast my sketch, making it practically new. William A., son of Elijah and Rosanna Keen, was born in Washington County, Tennessee, April 20, 1820. His mother was a daughter of Isaac White, who was of English descent. His father was also English, a man with an "ambitious, driving disposition," full of energy and will-power. His grandfather, Joseph, was an "honest" stonemason, born in Maryland. His great-grandfather, Matthias Keen, lived near Harper's Ferry, in Virginia, and married a Harper. His grandmother, on the maternal side, was a Vaughn, of German extraction, while the paternal grandmother, a Waller, was Welsh. It is to these elements-Welsh, German, English- our subject was indebted for his oratorical temperament and fire, his unconquerable will and splendid physique, a massive frame, six feet one inch, 240 pounds avoirdupois, lungs of brass, a voice deep, sonorous and commanding, brain and head made to fill a 7 3/4 hat. Brother Keen's spiritual birthplace was Fall Branch, and the date, November 16, 1841. 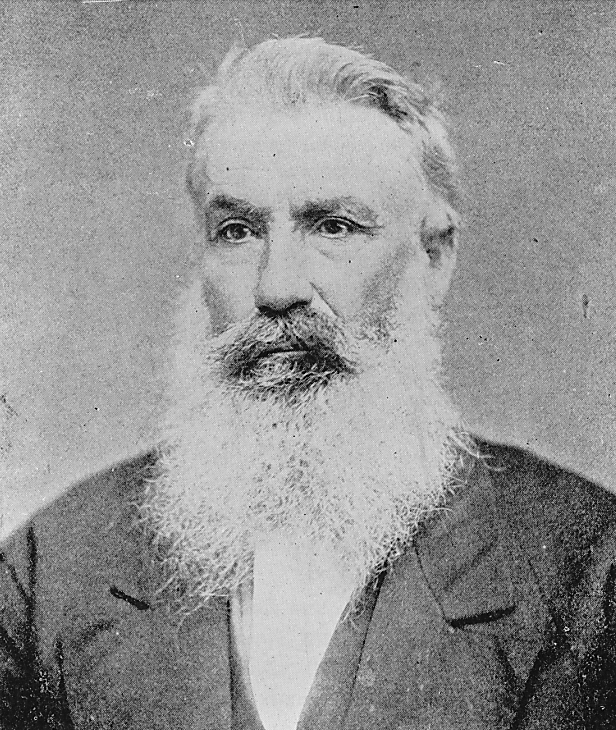 Many a time he had been "torn up," as he described his experience, by the powerful preaching of James Gilbert, but his conviction did not ripen into conversion until the time of that marvelous "five days' meeting" at the Fall Branch Church, a meeting held by Pastor Jesse Riggs and Missionary William Cate, in which seventy-five souls were made willing captives of Christ, W. A. Keen one of them. As soon as converted he offered himself to the church for membership, was baptized by "Father Riggs," and, putting on the armor, began forthwith to lead in public prayer and hold prayer meetings. He was licensed to preach by Fall Branch Church in August of 1842, and preached his first sermon in September of the same year. In 1845 he was ordained to the full work of the ministry, Elders Jesse Riggs, Emmanuel Rutledge and John P. Baxter constituting the presbytery. In his early years young Keen was providentially denied the privilege of attending school, having lost his father when he was only eighteen months old. This providence made it necessary for his widowed mother, "with needle and loom.," to support and educate as best she could her four "helpless" children till they were able to support themselves and help her in return. As the boy, William, grew to manhood, however, he "cradled, mowed, grubbed and plowed at $8 a month and bought home-made jeans' at $1.12 1/2 a yard, to wear to school, now and then, a little at a time," as he had opportunity. He attended a "grammar school" some, but gleaned most of his grammar from critical reading of books in after life. In the schoolroom he learned to read, largely, from the New Testament, which gave him his Baptist bias, in spite of his Methodist environment. In his academic course he had fairly begun the study of Latin and was arranging to go to college, when an attack of fevers disarranged his plans, and ended his school days. He has been a great student, however, in the school of everyday life. His text-book in Logic was Carson on "Baptism," which he carefully read through once a year for several years in succession. "Carson taught me how to conduct an argument," was his tribute to that Baptist scholar and polemic. Locke's "Essays on the Human Understanding" was his text-book in Metaphysics. "Paul to the Romans" was his favorite exercise in mental gymnastics. Parts of this epistle he would read over as much as "fifty times," to get the clew to the apostle's great argument. It was discipline like this, persisted in for more than half a century, added to the natural endowment of a great mind, that made him what he was at 75, a truly educated, self-made, masterful man, an intellectual giant. William A. Keen was par excellence the historian of our denomination in upper East Tennessee, if not in the entire state. None of us know Baptist history as Brother Keen knew it. He was familiar with the whole field of Baptist history and polemic warfare, knew every foot of disputed territory between Baptists and all other denominations. Booth's "Pedo-baptism Examined," with its citations of authorities, was the nest-egg, or seed corn, of what became a standard historical library. He devoured Pengilly and the "Baptist Library," and mastered Wall's "History of Infant Baptism" and Gale's "Reflections" on the same. Jones, Backus, Cramp, Orchard, Mosheim and Benedict were to him old familiar acquaintances. He knew Neander, Robinson, Moses Stuart, Cathcart and Armitage, and numbers of smaller works on both sides o£ controverted questions, besides keeping up with The Tennessee Baptist from its beginning. He was master of "Dutch Martyrology," Ramsey's "Annals of Tennessee," and the Minutes of the Holston Association. He knew our pioneer history to perfection. I count it my special good fortune to have been providentially permitted, during the lifetime of Brother Keen, to spend days with him in his library and take "notes" as, with remarkable memory and evident delight, he recounted the self-sacrificing deeds and portrayed in character sketches the lives of our veteran preachers of the cross. He was not only a historian but a theologian as well. He could have been a master in theology, if he had chosen to study the text-books on the subject. He chose, however, to formulate his own system of theology (a modified Calvinism) directly from the Bible, and solely for preaching purposes. His sermons were small bodies of systematic theology and practical divinity. As pastor, he served the following churches faithfully Fall Branch, twenty-one years; Buffalo Ridge, twenty-five years; Limestone, about the same; and, for a shorter term, Muddy Creek, Holston, Indian Creek (now Irwin), Harmony, Clear Fork, New Lebanon, Roaring Spring, Beech Creek, Long's Bend, New Hope, Hickory Cove, McPheeters' Bend, Walker's Fork, Kingsport, Double Springs, Blountville, Cherokee, New Salem, Lovelace, and Bethany. Through a period of more than fifty years of pastoral life he fed the churches of his charge with the "pure milk" and the sound "meat" of the Word, emphasizing the "doctrines of grace" and holding up the New Testament pattern of church polity and practice, never receiving a salary of more than $250 a year-on an average about half that amount. As associate missionary of the Holston Association, with Elders William Cate and W. C. Newell, he received a compensation of thirty cents a day. Associated with "Asa Routh and others," under the direction of the General Association, he had "glorious times" in revival meetings, receiving "souls," but little else "for his hire." Those were days of "small things" in the way of missionary enterprise, and there was little in the treasury to reward the missionary. Elder Keen was not only looked up to as a "father in Israel," but for years was an acknowledged leader in his association -- the Holston. For fourteen years he was its moderator, and eight times preached the annual sermon. As a presiding officer he was dignified and capable, was well posted in parliamentary law and Baptist usage, and eminently just and impartial in his rulings. He not only presided with dignity and ability over the deliberations of his own association; as a representative he was often in the councils of the denomination, a credit to himself and an honor to his association. In conference he was distinguished and able, always having weight, and, sometimes, by his influence and wise counsel, saving churches from schism and the cause from disaster. The open secret of his leadership was his sound sense, his knowledge of Baptist affairs, his conservatism, his preaching and executive ability, his personality, and, last but not least, his life. On account of a "lame" right hand, which made writing awkward and laborious, Brother Keen never wrote a great deal for the religious press - a regrettable fact, I feel, and a distinct loss to the denomination. For the same reason he has left few notes of sermons or other literary remains. We have, however, a partial compensation in the fact that Brother Keen, during a long and active life, made every effort to represent himself in person and to meet face to face with his brethren in all their denominational gatherings. This he did, conscientiously and always, to "the building up of his brethren in love." Another regrettable fact is that one of our Baptist colleges did not fall heir to Brother Keen's splendid library. I coveted a wagonload of his rare old books, documents, files of papers, minutes, etc., for one of our college libraries; and I am sure it was his intention at one time to make Carson and Newman the beneficiary of his gift or will. But time passed and circumstances altered the situation, and the library is now scattered. May be the books will still preach and do good. Brother Keen was first married in his twenty-eighth year, and was married five times. His first wives were delicate women and brightened his pathway but a little while. His last companion, a most excellent Christian woman, shared his joys and sorrows for nearly 'thirty years, and now survives him. Twenty years ago he had eight living children, and several that were dead. Elder Keen, mourned and lamented here, passed to his reward yonder, January 27, 1902. He rests from his labors and his works follow. 2. Brother Cox also relates how, at Harmony Church, on one occasion, Brother Keen took for a text God's question to Abraham: "Is anything too hard for the Lord?" (Gen. 18 :14) ; and, beginning with creation, with its manifold manifestations of the Divine creative power, then taking up the dim promise of a Savior (the seed of the woman shall bruise the serpent's head) made to man in the twilight of history, and pointing out the renewal of the promise to Abraham, God confirming the promise by a miracle (the birth of Isaac), and then, as a further staging of the great drama yet to be enacted, there was the portrayal of the immaculate and miraculous conception and birth of the Christ, and then, in fulfillment of prophecy, the tragedy of the cross, with its attendant horrors, the preacher reaching his climax in the description of the glories of redemption, in this world and the next, when suddenly, like the bursting of an electrical storm, "everybody shouted at once."